If I die, please tell your friends about me. On February 25, 2011 when my friend Muiz made this request, the revolution against Gaddafi had been going on for a week. On the streets fighting…fighting with hands…but we have no guns…people dying for Libya. His brother in law had already been killed, and Muiz was resolved to die as well. You have to know something, we Libyans aren’t scared to die anymore. I love Libya and I don’t want anything to happen to it. I will die for it. I never imagined having such a conversation with a friend on the internet. The last time I saw Muiz in Tripoli he was happy, smiling, and carefree, a computer engineer and fellow motorcycle enthusiast with his whole life ahead of him. Now his city was under siege by the mad man Gaddafi, one of the worst dictators of our time, and Muiz’s world was being destroyed. 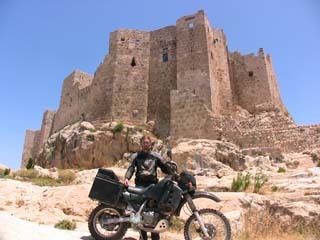 Muiz was part of a group of a dozen Libyan bikers who had become good friends of mine during my time in Tripoli in 2008. Hitem was their leader, a heavy-set, jovial biker with a heart of gold and smile always on his face. He was a master mechanic, and lived and breathed motorcycles. I asked Muiz if he had talked to Hitem. He said he tried to call him but there was no answer. I had been introduced to the bikers by Tarik, who had gotten me into the country at a time when Americans were not being issued tourist visas to Libya. He had bribed an official to get me a business visa that said I worked for a company I had never heard of, for what was supposed to be a one week “tour” of the country. Tarik let me stay in his office instead of a hotel, and I remained in Libya for six weeks before he was brought in for questioning by the regime and told by an official that he had to get me out of the country within 48 hours. We drove over 1,000 kilometers from Tripoli to Tobruk in one day to make sure I got out in time. We did, and Tarik had no problems from the regime. He had problems now, like everyone else in Libya. My lawyer cousin was shot in the leg yesterday while protesting. And Abdou, the bald guy who’s always with us, his cousin was shot with an anti-aircraft gun where Hitem lives. Two pieces when buried. I was out and saw three gunned down right in front of me by snipers. Tarik had made his decision. I’m going to see if I can buy an AK-47 tomorrow morning from a guy in the army. This is a duty. What has to be done shall be done. The words of my friends haunted me. I watched the news as the revolution began to unfold. The international community appeared to be doing nothing. 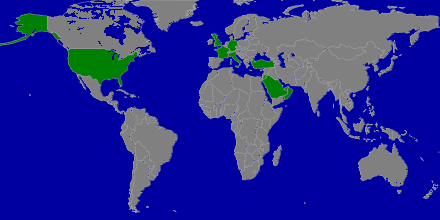 There was no appetite for military intervention. Gaddafi had the weapons, the ammunition, the tanks, most of the army, and his air force. The rebels had some pickup trucks with machine guns mounted in the back and Kalashnikov rifles. It was a dire situation, and the world seemed to not care. Muiz asked me why nobody is helping them. That was it. I told him I would be there. I called my mother and told her I was flying to Libya to help my friends. She understood and was supportive. I then called my girlfriend at work and told her that she should come home soon because I was leaving for Libya that evening. She was naturally not as understanding or supportive. I wasn’t going to sit by and watch as Gaddafi killed my friends and their families. Tarik was right, it was a duty, and what had to be done would be done. I would go and stand by my friends, fight with them for victory and freedom, or die with them trying. 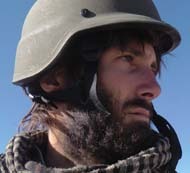 I had spent years living and working in the region, filming a motorcycle adventure documentary in eight Arab countries, and had witnessed and occasionally experienced firsthand what life was like under authoritarian regimes. The Arab Spring was a pure revolutionary movement, one that was long overdue, and one that was noble, just, and necessary. There would be only one opportunity to overthrow the regimes, because each would learn from the mistakes of the other, and each would arrest the troublemakers and spread the fingers of their security apparatus so deep into society that they’d have children informing on their own parents by the time it was over. There was only one chance to get it right, all or nothing, before the regime could get back on its feet. My ideological belief in freedom and democracy, formed by years in the region, combined with my strong friendships in Libya compelled me to take up arms as a freedom fighter. I would not have gone if it weren’t for my friends. I would also not have gone if the war was taking place along mere ethnic, religious, or sectarian lines. I would have had no role in such a fight, even to help my friends. But when my friends were fighting for freedom I could not abandon them. So I went. My plan was to go to Benghazi, join the revolution in whatever capacity I could (as a fighter or civilian volunteer, if they refused my participation as a fighter), check on my friends in Tripoli when the war was over, and come home. When I got to Benghazi I called my Libyan friend Nouri Fonas, whom I had met in Mauritania in 2007. Nouri, who was a hippie the last time I had seen him in 2008, had become a warrior. When I saw him now in his military uniform and flak jacket, a man who had travelled the world for ten years in the name of “peace and love” but who now talked of it being “the time for war,” I knew that yes, it was the time for war, and that I could join the ranks of the Libyan rebels. Starting that first day I was working for the revolution, helping to repair the pickup truck we would be using, moving weapons and ammunition, and planning for the war. I called Americans I knew with military experience to ask for advice on weapons. We worked tirelessly to get ready for our departure to the front lines, as Gaddafi’s forces swallowed one town after another on their way towards Benghazi. On March 12 I went to Brega on a reconnaissance mission with three other men while Nouri continued his work at an army base in Benghazi. On March 13 we were captured in an ambush. Knocked unconscious during the ambush, I have no memory of what happened. I woke up in a prison cell to the sounds of a man being tortured in the room above me. I was kept in solitary confinement for 165 days, undergoing severe psychological torture. The Gaddafi regime denied having me for over 4 1/2 months. The world thought I was dead. Finally they admitted I was in custody but refused to say where I was. I was in Libya’s most notorious prison, Abu Salim. On August 24 escaping prisoners broke the lock off my cell and we ran for our lives from Abu Salim Prison. I waited in Tripoli for Nouri to arrive from Benghazi, and checked on my Tripoli friends I had come to fight for. Muiz, Hitem, Tarik and the others had all survived. Nouri and I returned to the war. Some people in America questioned my decision to return to the front lines. I had just spent five and a half months undergoing psychological torture in solitary confinement in one of the world’s worst prisons, and they thought I should come home. So did my girlfriend. My mother didn’t pressure me to come home. She knew what I would do after prison. She was the one who raised me to keep my commitments. I had made a commitment to the revolution when I went to Libya, a commitment to my friends and to the men I was captured with that I would not leave Libya until Libya was free, and I was going to honor that commitment. She also knew that I wouldn’t leave behind the men I was captured with. Nothing had changed just because I went through a horrible experience in prison. I was still alive, still physically able to continue service, and I had an obligation to return to duty. If anything I owed more because I had not been able to contribute during the time I was in prison. My reasons for fighting in the war had changed, however. My friends in Tripoli were now safe. But there was no way I would leave Libya while the three men I was captured with, Ali, Mohammed, and Sharif, might still be alive in prison somewhere in Libya. Furthermore, as a POW I wouldn’t leave the country if there were any POWs still being held in Libyan prisons. When all cities in Libya were free, then I would go home. Nouri and I returned to the front lines together. We joined the Ali Hassan al-Jaber Brigade of the National Liberation Army of Libya. I was issued a Libyan military ID and we were assigned a jeep, which we outfitted with a Dushka heavy machinegun. Nouri was the driver, and I was the machine gunner. We had 40 engagements with the enemy, mostly at the Battle of Sirte, and were nearly killed a few times. 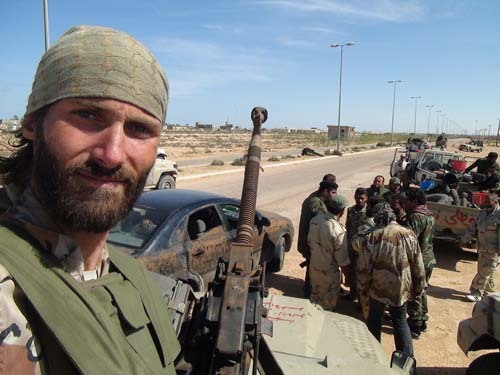 We served honorably and helped defeat Gaddafi’s forces in Sirte. On October 20 Gaddafi tried to escape Sirte, and was captured and executed. With the war over, Gaddafi dead, and all POWs free, I said goodbye to my friends in Tripoli and Benghazi, boarded a plane, and came home. The men I had been captured with in Brega were never found, and the information we have suggests that they were executed by the regime with many other prisoners shortly before Tripoli fell in August. I have no regrets about fighting in the Libyan Civil War. I would do it again without hesitation, and if Libya ever faces the threat of authoritarianism again, I’ll be there helping to overthrow that regime as well. My experiences in the war and in prison changed me forever. Serving with brave and honorable men on the battlefield, suffering in solitary confinement, hearing the cries of those tortured by the regime echo through the prison walls, and seeing people’s faces as they celebrated freedom for the first time radically transformed me. I am now defined by an unyielding opposition to authoritarianism, and will do whatever I can to remove this blemish from the pages of human history. A wave of democratization is sweeping across the world. Authoritarian regimes will fall like dominoes, and I will do whatever I can to help kick those dominoes over, including participating again as an armed combatant. This begins with the Arab Spring, but it ends with the Iranian, African, and Asian Springs. The 21st century is the century of freedom.